Happy Friday and the second day of March! Where did February go? It’s no secret that I’m a big fan of kale. Not only do I enjoy eating kale in a salad like this one, but I also enjoy making kale pesto, adding it to my pastas, soups, and curries, and blending it into a smoothie! 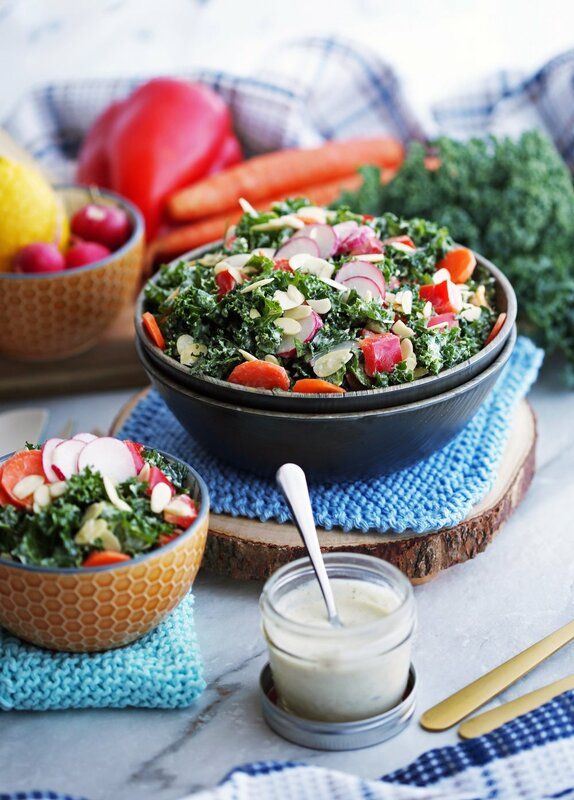 This recipe is a delicious and quick Crunchy Kale Salad with Parmesan Yogurt Dressing. Why do I like kale so much? First and foremost, I like the flavour of kale. It’s tastes “green” and slightly bitter when eaten raw and picks up delicious flavours when cooked with other ingredients. The majority of time I use curly kale since it's usually the most accessible, year-round kale variety at my supermarket. Second, kale is a nutritional powerhouse. It's high in vitamins A, K, and C, a good source of iron and fiber, low in calories, and has zero fat. So many health benefits! Third, it is a versatile green vegetable. As you see from my list above, you can add it to so many recipes. Chop the kale into small pieces and massage with olive oil so that it breaks down the tough fibers and makes the leaves more tender along with lessening the slight bitter flavours of raw kale. Save the woody stems and use them in smoothies or add them to your next batch of homemade vegetable stock. In addition to kale, I added in some delicious carrots, radishes, red bell pepper, and sliced almonds to the salad. The carrots and bell pepper gives the salad a little sweetness, the red radishes gives it a little peppery bite, and almonds give it a nutty crunch. Since all of these vegetables are crunchy, I like to chop or slice them small so that it is easier to eat. You can also grate the carrots for another change in texture. I have done that in the past for this recipe as well. As much as I love kale, my husband is all about radishes. As a child, he used to eat them along with green onions as a snack almost every night. Weird, right? We went to a farm to pick berries a few summers ago and Scott noticed these massive over-sized radishes on sale. It was like a dream come true for him; I've never seen someone so happy eating a radish. All the vegetables are wonderful in the salad, but the REAL STAR OF THIS DISH is the homemade Parmesan Yogurt Dressing. I may be a fan of kale, but I love cheese. As I type this post up, I am currently snacking on some cheese (Emmentaler to be precise) along with some crackers. This creamy dressing has a good amount of aged parmesan, which has that amazing umami, pleasantly pungent, cheesy flavour. In addition to the cheese, I opted to use zero fat tangy Greek yogurt instead of mayonnaise or sour cream to make this dressing so wonderfully creamy. Greek yogurt has way less calories and fat, plus more protein, than it’s condiment counterparts. The other ingredients in this dressing each have strong flavours (e.g. dijon mustard, garlic, and lemon juice), but compliment one another so well. Tasty and nutrient-rich: Veggies are healthy, naturally sweet (radishes also have a little spicy bite), are good-for-you, and colourful. The parmesan dressing is EVERYTHING: Creamy, cheesy, and loaded with umami flavours. It is made healthier than typical mayo or cream-based dressings due to the addition of Greek yogurt. Full of crunchy textures: The crunch makes it satisfying to eat. Quick and easy: About 15 minutes or less of prep work. An lovely side dish (or appetizer or quick meal): Serve it with some additional protein for a well-balanced meal. Can be made ahead of time: Prepare the ingredients and dressing in advance. Just store the salad and dressing separate in the refrigerator. Gluten-free: Great for those with these dietary restrictions. I hope you enjoy this recipe! If you make this recipe, please leave me a rating and comment down below or tag me on any of my social media. 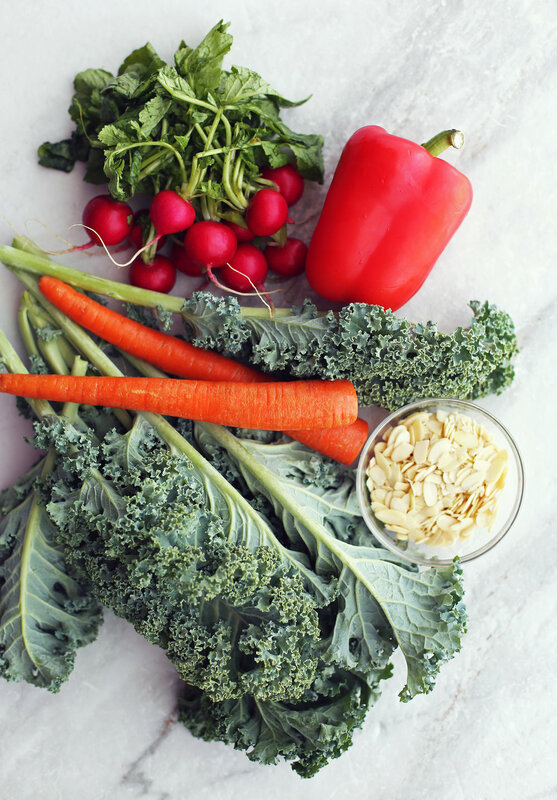 Place the chopped kale along with one tablespoon of olive oil in a large bowl. Using your hands, massage the kale for 2-3 minutes, until the kale begins to soften. Set aside. In a high powered blender, add the dressing ingredients and blend until well combined and creamy. Taste and adjust the dressing to your preference. Add the remaining salad ingredients to the kale in same large bowl. Drizzle the desired amount of dressing on top and toss to combine. Serve immediately. *Parmesan cheese in this recipe was cut from a larger block (not pre-grated). I used a 24 month aged Parmigiano Reggiano. To keep this recipe vegetarian, make sure that the parmesan you choose is made without animal rennet; look at the cheeses' ingredient list for vegetable rennet or microbial enzymes. If you are planning to have leftovers, keep the salad separate from the dressing and cover both in the refrigerator for up to 4 days. Give the dressing a good stir before using.